Loot shooting with console friends sounds like it's under consideration. 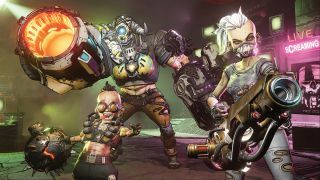 If you've ever dreamed of playing Borderlands 3 with your console-owning friends, but don't want to sacrifice the benefits of having much more powerful, expensive hardware, it sounds like 2K and Gearbox are considering crossplay for the game—even if it's not part of Borderlands 3 as it stands. Discussion around crossplay in Borderlands 3 started because a now-edited listing on the Microsoft Store apparently mentioned it (here it is being discussed on Resetera last week). GameSpot then reached out to 2K Games on the subject, and got a short statement that was non-committal, but actually pretty far from a 'no'. "Cross-play is something we're looking at closely, but we don't have anything to confirm or announce at this time," said a representative. In my experience, publishers usually just say "no plans!" or don't discuss things that aren't planned for a pre-release game—so at the very least, it sounds like it's under consideration. You might've heard that Borderlands 3 is coming to the Epic Games Store on September 13.